General Motors says that its new Mi-ray Concept, which debuts at this week's Seoul Motor Show, pays tribute to the sports car heritage at Chevrolet. Specifically, GM points out that the Mi-ray is "small and open" like the 1963 Monza SS, and "light and purposeful" like the 1962 Corvair Super Spyder. Whatever the case, the Mi-ray (Korean for 'future') is one sharp little roadster. Powering the Mi-ray are a pair of front-mounted 15-kilowatt electric motors, mated to a 1.6-kilowatt-hour lithium-ion battery pack that's partially charged via regenerative braking. The electric motor is mostly used for initial acceleration and urban cruising, but when higher speeds are demanded, power is sourced from the Mi-ray's 1.5-liter turbocharged four-cylinder engine, mounted behind the cockpit. This powerplant is mated to a dual-clutch transmission, and what's most interesting, is that apparently the Mi-ray can switch between front- and rear-wheel drive at the driver's whim. The majority of the Mi-ray's exterior is made up of carbon fiber components, complete with ambient lighting worked into the main character lines along both sides. Out back, each rear fender contains individual storage compartments, and carbon fiber spoilers at all four corners help with downforce and airflow. Inside, the Mi-ray uses leather, white fabric, 'liquid metal' surfaces and brushed aluminum to create what GM calls "sculptural velocity." A long center console separates the driver and passenger seats, and all of the car's vital information is displayed via a back-projected screen. The rear-view cameras are fully retractable, and in city driving, a forward-facing camera works alongside the car's GPS to overlay navigation information with real-time video. We highly recommend taking a few minutes to click through our high-res gallery of the Mi-ray Concept below – it's seriously pretty. GM's official press release is available after the jump, as well. 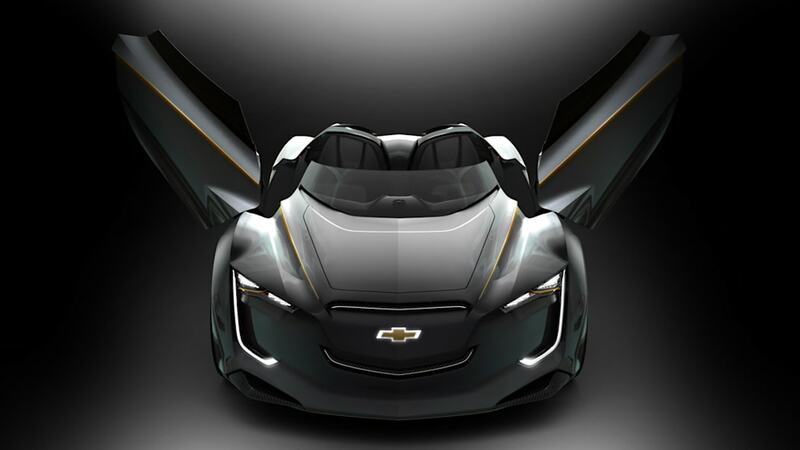 Seoul –Chevrolet introduced the Mi-ray concept today at the 2011 Seoul Motor Show. 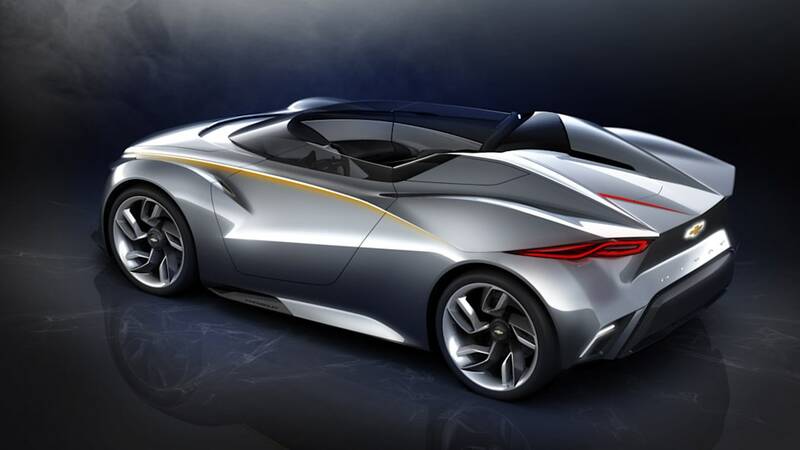 The roadster celebrates Chevrolet's 100-year heritage of designing expressive vehicles in the brand's newest market. According to GM Korea President and CEO Mike Arcamone, "'Mi-ray' is Korean for 'future.' 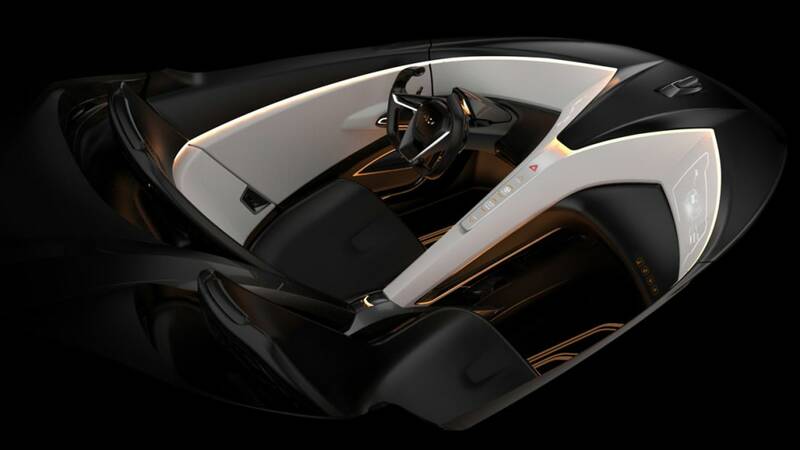 As GM rolls out Chevrolet across Korea, the Mi-ray concept offers an exploration of future possibilities for the brand. It strengthens the bond between car and driver, creating a fresh look at what sports cars of the future might be." 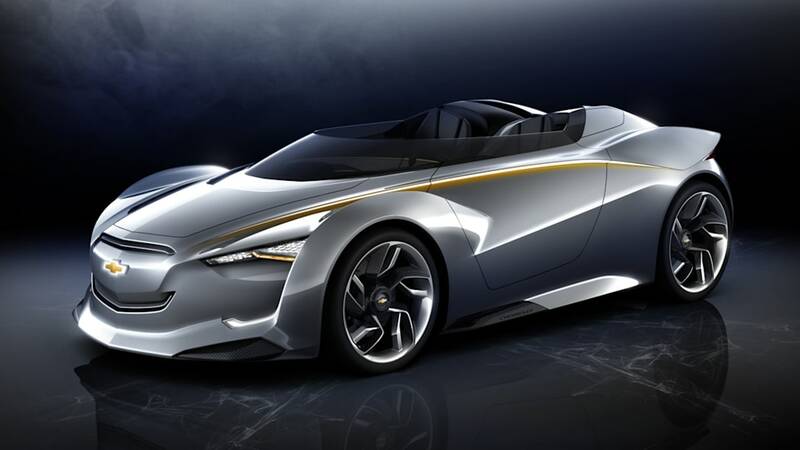 The Mi-ray pays tribute to Chevrolet's sports car heritage. It is small and open like the 1963 Monza SS, and light and purposeful like the 1962 Corvair Super Spyder. Its aerodynamic fuselage is reminiscent of modern jet fighters. The powerful front end offers a reinterpretation of the Chevrolet face. The Mi-ray's dual port grille is flanked by LED headlamps with new signature daytime running lamps. The front and rear fenders evoke Chevrolet Corvettes of the past and express the concept's sports car spirit. At the corners, carbon-fiber spoilers help control down force and airflow. Distinctive retractable flaps provide additional airflow control while providing access to the charge port on one side and the fuel filler on the other. The charge port also features an external battery charge indicator. Each rear fender contains individual cargo space for the storage of small items. Under the ducktail surface, the taillamps provide a new interpretation of Chevrolet's twin element identity. The heavily tapered top view enhances the Mi-ray's purposeful image. From above, the cabin has a unique diamond shape. The interior of the Mi-ray echoes Chevrolet's racing heritage. As with the exterior, it takes inspiration from jet fighters. The Mi-ray contains a melange of brushed aluminum, natural leather, white fabric and liquid metal surfaces, for an overall effect of sculptural velocity. The center touch screen flows down to an aluminum support, which evokes a fighter jet's nose with the landing gear down. The exterior surface waterfalls down into the interior to meet the reinforced console, connecting the front and rear of the car. The centrally located start button is also inspired by a jet aircraft. When the button is pressed, the column-mounted retractable meter cluster rises like a jet fighter canopy and "Interactive Projection" appears on the white surface. The Mi-ray features a concept "mid-electric" propulsion system, located primarily behind and beneath the driver, that maximizes performance and fuel efficiency. "Many of the components in the Mi-ray's propulsion system are a logical extension of GM's current technology portfolio," said Uwe Grebe, executive director for GM Powertrain Advanced Engineering. "The concept shows the potential for reconfiguring, rescaling and extending today's propulsion technologies." For performance driving, the Mi-ray's 1.5-liter four-cylinder turbocharged engine combines with the electric motors, providing spirited torque control to both the left and right wheels as needed. The high-tech engine, mounted behind the cockpit, drives the rear wheels while seamlessly integrating electrification technology that defines a new standard in the compact roadster segment. A dual-clutch transmission (DCT) enables a reduction in the powertrain's size by eliminating the torque converter. Shifts are quick and firm. The shift pattern has been tuned for improved top speed in performance mode. A start-stop system works in conjunction with the DCT. "The propulsion concept fits perfectly with the rest of the vehicle, delivering big performance in a small footprint, on the road and in the environment," said Arcamone. "By combining GM propulsion technology and visionary design, the Mi-ray points to the future of Chevrolets around the globe – expressive, youthful and entertaining."